As Learning & Events Manager (First World War Centenary) at IMW North and as a freelance practitioner, I developed digital interpretation for the Greater Manchester Centenary Partnership. I worked with the partners and developers to create Centenary Connections, a website and digital apps for iPhone and Android. The project was led by IWM North, and brings together content from 26 partner organisations across the city region presenting it in themed journeys and on a map. The site was created by software developers Substrakt and digital strategy specialists Ammba. The aim is to encourage visitors to travel between the partner sites, giving them the chance to engage with the First World War collections across the city in a different way. It has also given organisations the opportunity to try new methods of working together. My role initially was to engage partners in the project. This included organisations such as the People’s History Museum, Salford Art Gallery and Museum, the Fusiliers Museum and Archives+. Collectively, we explored interesting routes in to the objects and the stories behind them. Working as part of a small cross-departmental team, we created narratives, drawing the stories together. 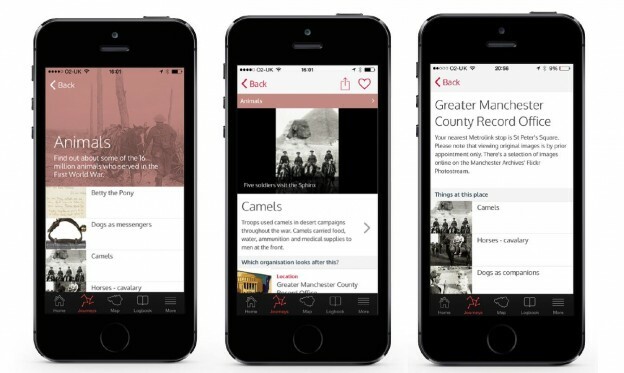 The content was then submitted and uploaded by the team at IWM North to Nymbol, the content management system. I worked closely with Ammba and Substrakt to shape the user experience and ensure that the site worked with the content we had gathered. As the content had been created by many different organisations, there was a range of voices and styles. I edited the text and images in order to create coherent, accessible copy suitable for a digital platform. I then created a Style Guide, bringing together the lessons learnt during this editing process. This Guide will ensure that future content from the partners sits comfortably within the site, and works well for the user.